Monday October 31st 1898 I put out a lot of clothes. Pink had washed Saturday and washed some more. I churned and got the meals so I was busy about the work all day. Will was digging potatoes. The boys both in the corn. Tuesday November 1st 1898 I ironed in the forenoon ad got the dinner. I did a lot of cleaning around in the afternoon as the weather was a little more pleasant. I fixed a bed for Miss dog and did the mending. wrote in the evening. Wednesday November 2nd 1898 I did churning and was busy with the work all the forenoon. Will took a load of corn to Hill Siding and went over to Wilsons. I practiced afternoon and evening. I was down to Callies jist a few minutes. Thursday November 3rd 1898 At the kitchen work all forenoon. I churned in the afternoon. Will took corn to Hill Siding. Callie was up to see me awhile. I practiced in the evening. 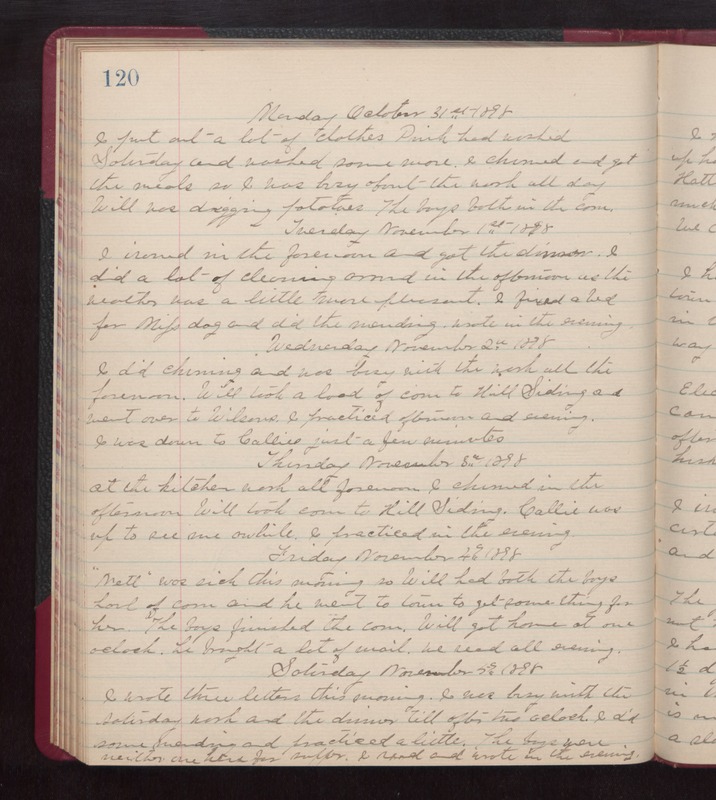 Friday November 4th 1898 "Nell" was sick this morning so Will had both the boys haul of corn and he went to town to get some thing for her. The boys finished the corn. Will got home at one oclock. He brought a lot of mail. We read all evening. Saturday November 5th 1898 I wrote three letters this morning. I was busy with the Saturday work and the dinner till after two oclock. I did some mending and practiced a little. The boys were neither one here for supper. I read and wrote in the evening.